"A Corinthian Column Pedistal Replica." This is a custom faux finished model! A Corinthian Column Pedistal with top and base. 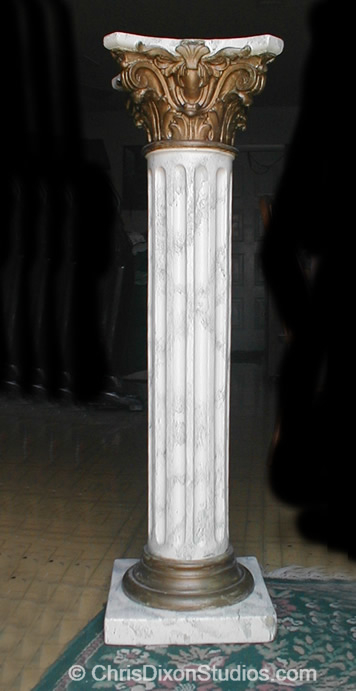 **This is a custom faux finished Corinthian Column Pedestal model! Fluted shaft Roman Corinthian column. Great for buffet countertops, console tables porticos and a wide variety of architectural elements. Exterior or Interior design quality. The perfect display for your garden plants or smaller sculptures bought here! Can be cut to sizes, faux finishes available. available unfinished.. About Our Epoxy Columns: These epoxy columns can be mortered like cement, caulked or glued in place. Our columns can be scuff sanded by a red/green -scrubby and painted with a good acrylic adhesion primer. They are less likely to chip. Have a more marbel-like appearance, unfinished! Great for buffet countertops, console tables porticos and a wide variety of architectural elements. Durable Exterior or Interior design quality. cast stone weighs 88 pounds; our poyxporcelain� is about 35 pounds. Can imbed hardware to bolt top to column and base to floor! Very Durable and strong epoxy based compound is suitable inside or outdoors. Corinthian Column Pedistal facts info will be added here!. Other Corinthian Column Pedistal, sculpture stands plinth.